I’ve been parenting for twenty-two years. My kids are gone and I still weep over random things. Just about anything makes me sob. Thirty second commercials, an unexpected lyric in a song, watching an exhausted kid cross the finish line in a cross country race, feature-length Disney movies and a million things in between. Who am I kidding; even a mere thought sends waves of the wet stuff into my eye space! So when people ask why I am crying, my response is often, “who the Helen knows?” Moms cry. Fact of life. Maybe too much emphasis is put on the why of perpetual crying and not enough thought into why not. Moms cry. So what? I like to think of tears as emotional heartspeak. We shed tears when we’re mad, sad, glad, angry, scared, joy-filled, grateful. The shared thread being God is the maker of tears and we are the instrument to bear them. I don’t mind my leaky faucet temperament because I figure God’s saving all my tears for something special in Heaven. He tells us He collects each one in a bottle after all. All of us moms might be in for an eternal surprise one day. Maybe He turns all our duct draining into a delicious red wine to enjoy in Heaven. You never know. Tears represent our soul’s response to what we are experiencing. And the profound miracle of motherhood is a constant variable which turns our hearts to mush; magnifying the nuances of all things humanity. 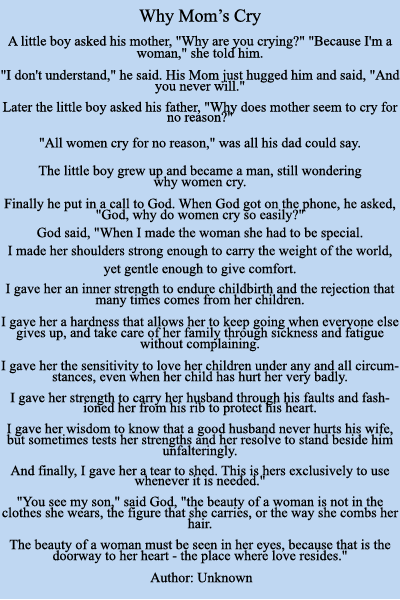 Mom crying is a universal phenomenon across the globe, connecting us by heartstrings regardless of race, gender, religion, etc. Our hearts appear to have a gravitational pull towards every other mother’s heart and every other child on the face of the earth. We can see a mother crying in a video half-way around the world and immediately feel an ache which longs to reel her in and comfort. A complete stranger child being mistreated and bullied can cause an instant desire to step in and protect. When you stop and think about our mom heart, we are blessed to have such a formidable force as the seat of our soul. All the snivels and wails remind us of this gift. And lest anyone forget, we also have the mystic capacity to hold all the emotion in when showing strength matters most. Embrace the Kleenex, crazy Mommas!